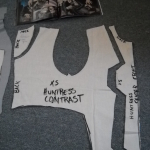 24-APRIL-2011 The design has begun on this commission for a HUNTRESS costume which I’m only undertaking because it’s for a friend of mine. 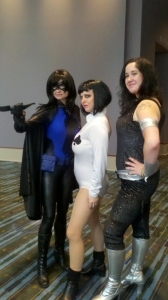 I’m responsible for the bodysuit and the cape. Luckily I happen to have the trade paperback of Year One so I compared those images to ones I had found on ComicVine. As it turns out there’s a lot of subtle variations. No surprise there. Every artist put his own flare into a character. I’m working on a HUNTRESS: YEAR ONE variation costume for a friend. She’s a completely different size than I am so I had to create a new pattern tracing over one of mine and adjusting it. 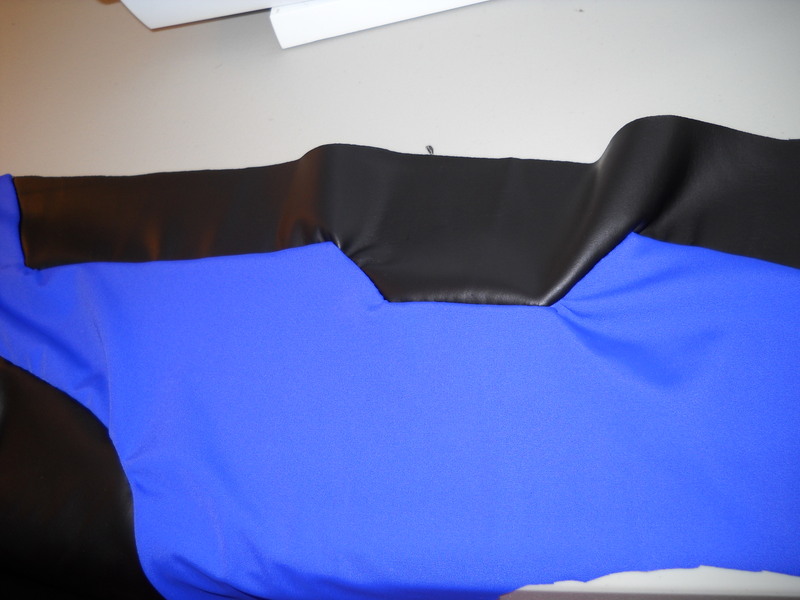 We’ve looked at different fabric and decided to go with the Matte Metallic in Black for the main part of the suit. For the contrast color which is purple, we’d going with a great shade that’s really vibrant in Milliskin Matte Tricot. There are times when the purple looks like a “V” shape in the front but other times when it looks like a separate vest. 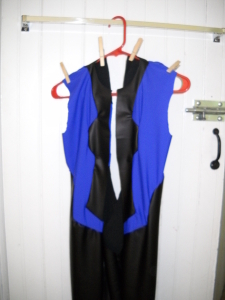 I’m going with the vest look after consulting with my friend about how she didn’t like the style where the purple actually looks like a bathing suit over the bodysuit. We’ve also decided to go with a black crepe for the cape rather than purple so that it can used for other characters; modifying designs this way is one of my essential tricks. 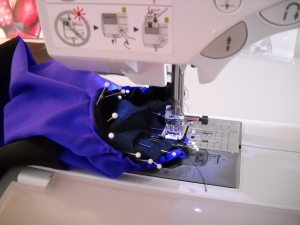 Whether a wig, belt, boots or gloves aren’t perfectly accurate don’t mean as much to me personally as getting use out them because this stuff is not cheap. It’s often labor-intensive if I’ve built the piece myself and/or expensive for the raw materials. Versatility is key! 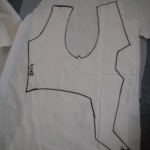 Using the Kwik Sew 3052 figure skater pattern as a basis, I traced over the initial pattern onto muslin. 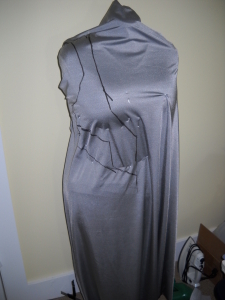 I took some time to drape spandex over my dress form (again it’s my size but I just needed an idea of the vest shape). 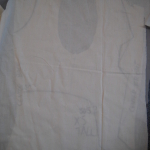 Then I sketched on the muslin while referencing that panel above until I came up with lines that I hope will work. I highlighted the final lines in fabric marker. Traced that muslin with a different muslin so that I’d have the one original full-length suit pattern and then use the second to cut up into individual pattern pieces for color blocking. 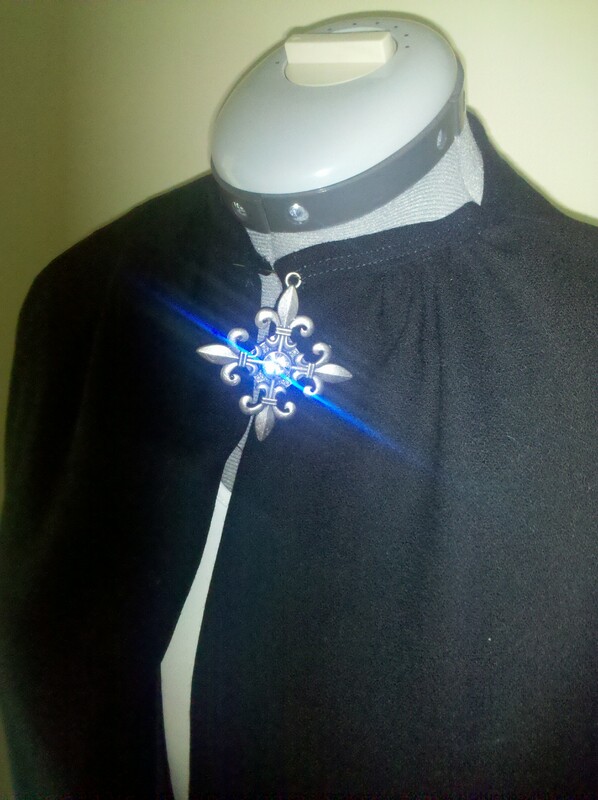 The cape was modified from a commercial pattern. 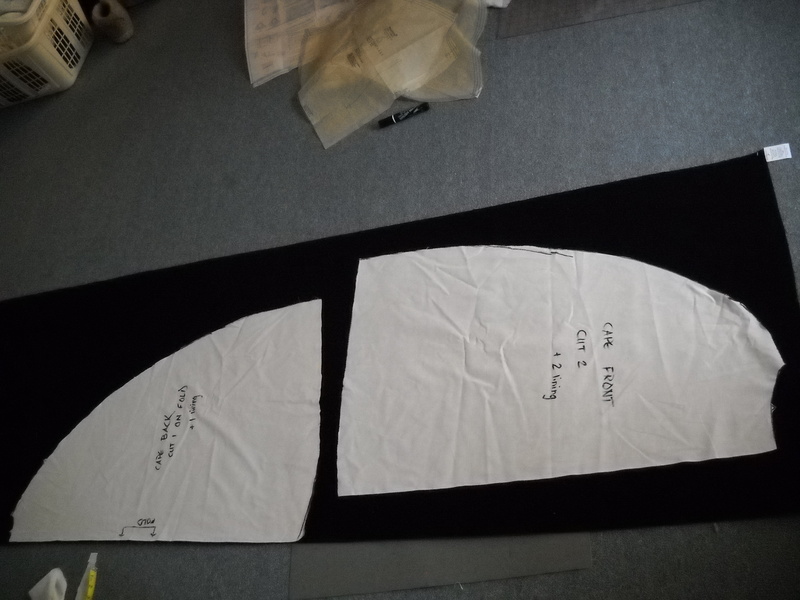 I didn’t have bias tape on hand so I made a strip of the crepe, pressed it in half lengthwise; then pressed each long side into the crease that was just made. 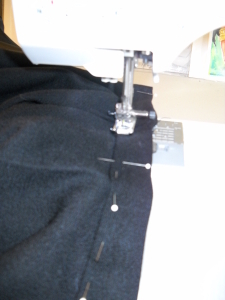 Hemmed the short edges in 1/2 inch. With the cape neckline gathered to the correct length (in this case 16″), straight stitch one of the folded over lengthwise sides. 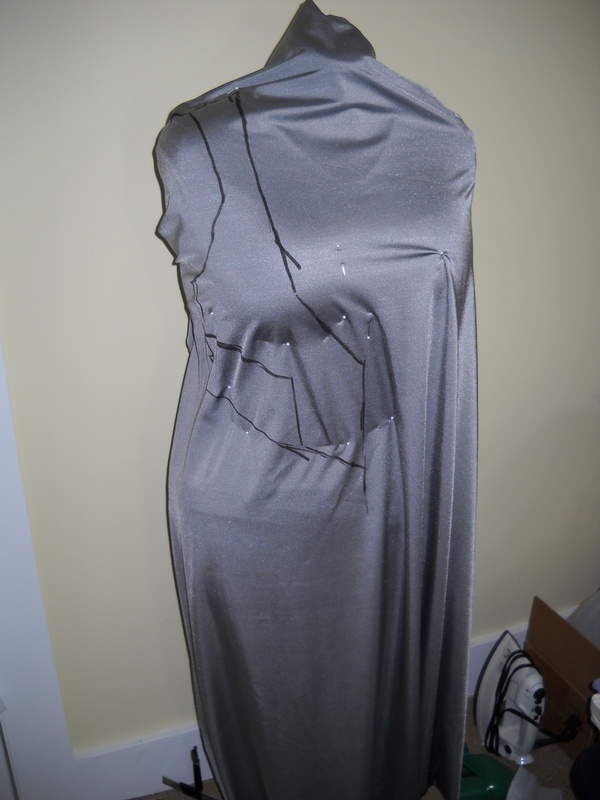 Fold over the remaining side over the top of the gathered neckline and top stitch. In my case, I did two rows to make sure I got it on there securely. 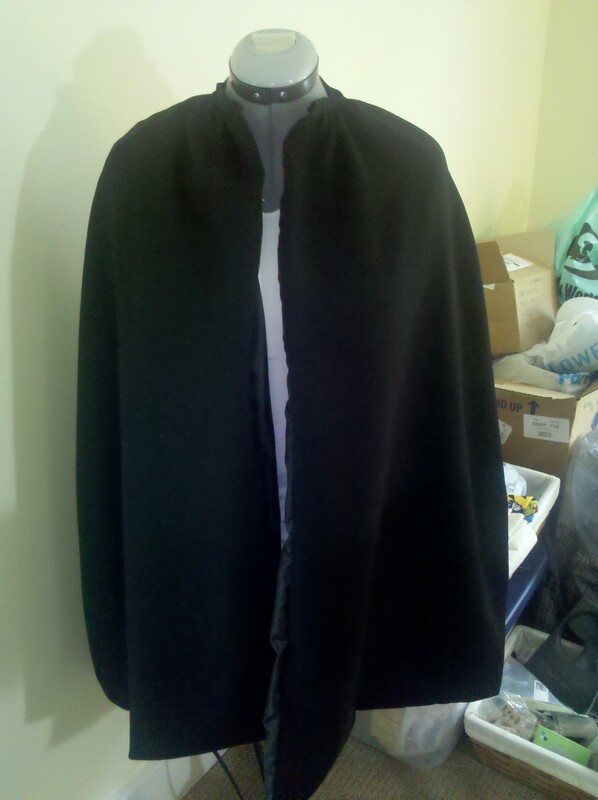 Cape assembly is completed. Fully lined. The last touch is that I took a bracelet, jump ring and a large charm to make a closure clasp. The color blocking: I made sure the black and contrast (purple) pieces lined up. Put the right sides together and basted. The tough part for me is corners and this design had a lot of them! You have to use a lot of pins and cut into the corners so that the fabric will lay correctly. This design is like a faux vest. Each artist obviously varies the design; sometimes the same artist varies it from page to page in order to simplify a scene. 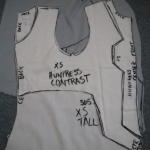 Huntress’ vest always looked “attached” and not like a full full vest that would meet upward along the chest. 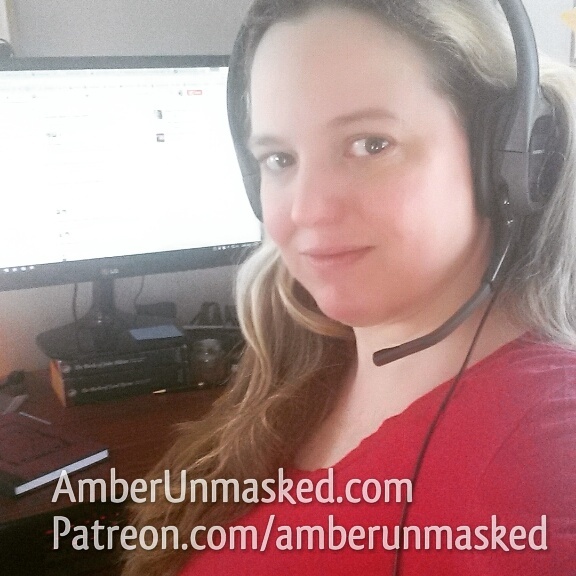 So it’s done as color blocked contrast here. 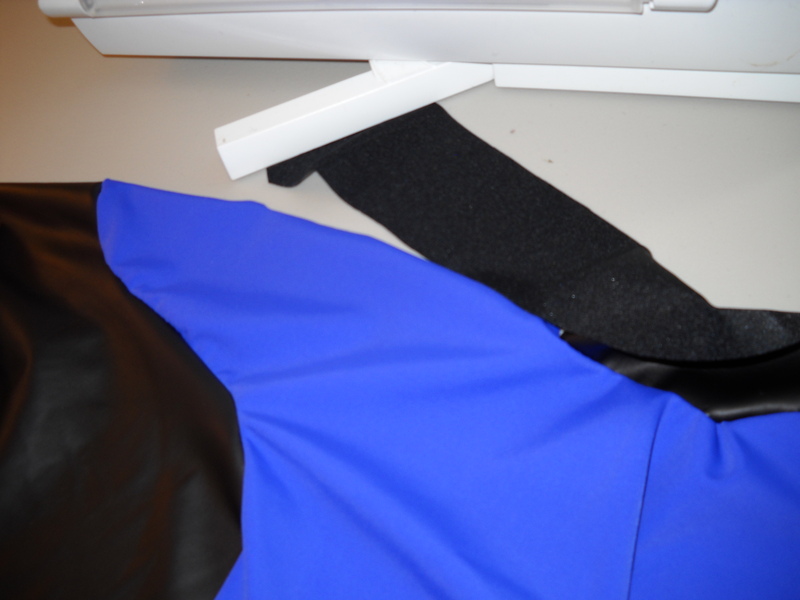 Once the color blocking of the left and right sides of the suit were done, the legs were basted at the inseam. Then the left was attached to the right. The sleeves were installed. Normally I don’t have a problem with sleeves. 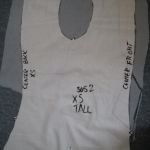 For some reason this time, the armholes were much too big even though I traced them and the sleeve from a pattern that worked before. Maybe because this was the first time I used the XS size and didn’t have it tested, I had trouble. 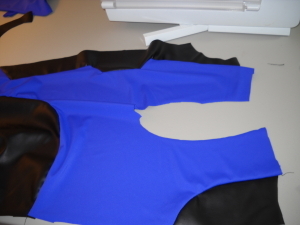 Anyway, I had to baste the purple around the arm holes and gather. Unfortunately the gathering is a very different style than smooth/sleek attachments. 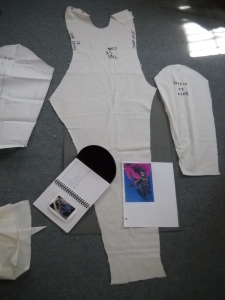 The shoulder width also looks very small so this definitely needs a client fitting. The crotch needed alterations and Trish still isn’t comfortable with how that isn’t fitting properly. She said she’ll get bootie shorts to actually cover that. I loved her props!